The most important feature of the shungite knee pad is its pain relieving and anti-inflammatory effect on the knee joint. When placed in the fabric pad, the sungite chips favor the metabolic processes and hematogenesis in the very first minutes after you apply the pad to your knee and thus relieves swells, nerve terminal compression and painful feeling. Due to the complete embrace of your knee joint, the healing effect of the knee pad is uniform to the maximum. As a result of its daily use, the muscular functions are recovered, the damaged ligaments and blood vessels are regenerated. It's worth mentioning that the range of favorable properties of this mineral is quite wide and versatile. It is mined in the pure for in the only place in the world – the Republic of Karelia – and is considered a fragment of the Planet Phaeton that disappeared millions of years ago. Thus, shungite can influence the human karma in some mysterious way. As a high-class watchmaker, this unique mineral copes with the troubles of our body "mechanism" with filigree precision making all the systems work in unison and accurately. You can just use shungite water or have some dull black gems from the Karelian field within your reach and you'll forget about your depression or broken-down condition, sleep disorders and chronic fatigue. All kinds of geopathic fields that are known as a serious threat for the human health lose their power with shungite. 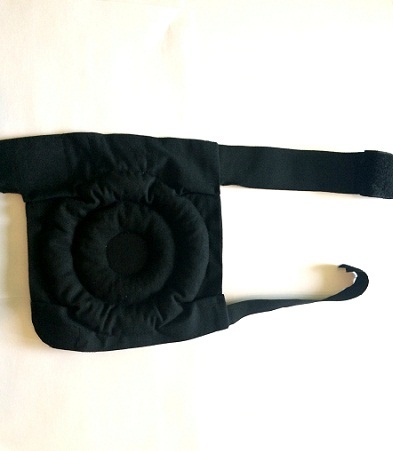 A shungite knee pad is a great way to make your joints healthy again, get back your vitality, vigor and good mood. It hardly has any counter-indications but those who suffer serious heart diseases or individual component intolerance should consult their doctor. Don't weal the knee pad longer than eight hours consecutively.